Here’s my latest, yet another baby quilt for a coworker. If my colleagues keep reproducing at their current rate, I may actually make a dent in my fabric stash (or I would if I’d stop buying more fabric, anyway). 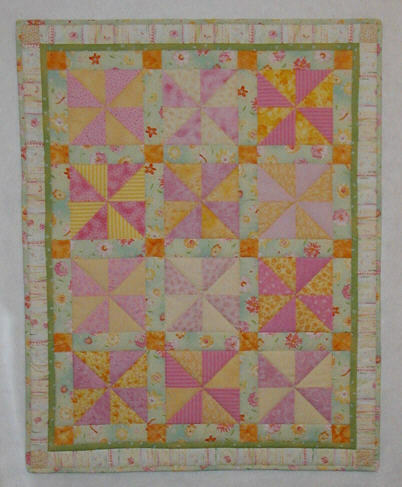 For this one, I actually started with a pattern– Lauren’s Pinwheels from Fon’s and Porters’ For the Love of Quilting magazine– and mostly followed the directions, which is a bit unusual for me. Of course, I didn’t make it exactly like the pattern, since making things up as I go along is a big part of the fun of making quilts for me. My quilt is smaller than the one in the magazine, and uses more colors, and has a different border treatment. I wasn’t sure it was going to get a border at all. After I got the pinwheels and sashing sewn together, I pondered whether I was done. If I didn’t add a border, I had enough of the light green sashing fabric for the back, but that would leave the quilt on the small side and possibly complicate the binding decision because I’d no longer have the sashing fabric to choose from. I asked Mr. Karen, and he thought it needed a border, maybe a dark green one. I pulled out a few greens to audition (none of them as dark as he’d envisioned, as it turned out) and liked one of them but thought it would overwhelm the quilt if I made the border as wide as I thought it should be to balance the sashing and bring the quilt up to a more standard (for me) baby quilt size. Thus I ended up with two borders– a narrow green one and a wider light pastel print one. I figured out if I put corner blocks in the outer pastel border so I wouldn’t have to cut long strips to allow for mitering, I’d have just enough of that print for the back. And so it worked out, with the sashing print used for binding. Voila! Le quilt est finis! I’m fairly happy with how it turned out. It’s certainly cheerful, and even though the color scheme is controlled, there are a lot of different fabrics to look at. Many of the points in the pinwheels match, and the corners are almost square. I am now only one coworker baby behind (counting just the ones who’ve been born, not the ones on the way), but that baby can wait, since his older brother didn’t get a quilt until his first birthday. Next on my list is a special memory quilt for the woman I met thanks to United We Quilt; I want to do my very best work on that one, so it may be a while before I can write my next completed quilt entry. Someday I am definitely going to get back to that calendar quilt I started in mid-2000. I don’t feel that bad about putting it off, though, since just last weekend at the quilt show I found a particular fabric for it that I’d been searching for since late 2000. (Unfortunately, I found it in two small pieces and the motif I most wanted was not complete in either of them, but hey, it’s the closest I’ve come in all this time so I’ll deal).